Your chimney, like most chimneys, probably appears to be in fine condition on the outside. But let's take a look at what really counts in chimney operation...the inside. When we look at the interior of the same chimney we can find a number of imperfect conditions. Pieces are missing from the original clay liner and there are cracks in the clay liner. (Old chimneys might not even have a liner.) Mortar and bricks are loose and falling. And there is excessive buildup of combustable creosote on the flue walls. These conditions are the result of a number of possible causes, including: flue fires, an improperly vented or misused stove, poor construction, excessive moisture, and more. With continued use of this chimney, any of these conditions could lead to loss of property or life. 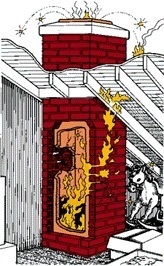 It happened thousands of times last year - chimney defects resulted in home fires. It doesn't take much to start a home fire... a spark flitting through a crack in the chimney wall into the attic... a chimney ember igniting a creosote fire which then climbs the full height of the chimney "looking" for a breech in the chimney wall... or simply excessive heat reflected through chimney walls when a clay liner is missing or damaged. 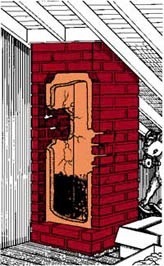 Fortunately, the problems of a deteriorating chimney can be corrected without completely rebuilding your chimney.